Welcome at the Needle Art Tattoo web-page! The Needle Art Tattoo studio offers every imaginable style of tattooing. The studio in Gorinchem, Needle Art Tattoo, established in 2003 in the beautiful city center and accommodates 7 award winning International artists. Through the years this high-end tattoo studio, partly by the outstanding quality of the artists working here, became one of the most famous of Western Europe. Ridiculously long waiting lists do not occur at Needle Art Tattoo. Because there are several artists working on daily basis the waiting list can be limited to several weeks. During business hours everybody is welcome to come in and check out the studio, the artists and our method of working. For a consultation with one of our artists an appointment is required. IQ, that stands for Infinitum Qualitas, represents and unites 3 high quality tattoo studio's in The Netherlands. and infinite quality of tattooing. Also Needle Art Tattoo is part of IQ Tattoo! All studios affiliated with IQ Tattoo continue to use their current name and will operate as usual. The only difference is that there will be more interaction and collaboration between both residential- and guest artists who, of course each have their own unique style and way of tattooing. 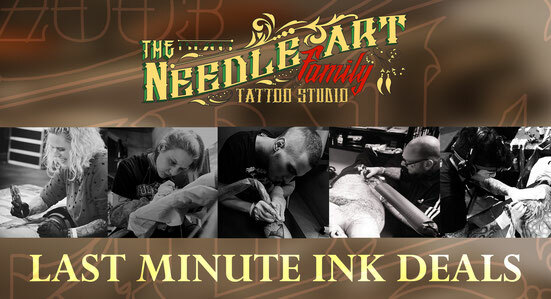 At our studio the minimum age to get tattooed is 18, regardless the rules of the Dutch health department. No exceptions, photo ID required! For International clients we offer a free shuttle service from/to any nearby train station or airport. Please send us your travel itinerary if this service is needed. When booking/confirming an appointment, including consultation appointments a deposit is required. When there are multiple sessions needed the deposit will be subtracted from the total amount after the last session. If there is no appointment booked within 12 months after the consultation appointment the deposit is no longer valid and can not be used again. Payed deposits are non refundable! Appointments can be rescheduled for (un)determined time. In case of cancellation or reschedule too late deposits can not be claimed. Gift cards can be purchased for the amount of your choice, are valid for 6 months and are non refundable. Only after approval there is a possibility to expand the validation with 6 more months. When purchasing a gift card online we charge €1,95/Netherlands en €4,95/Europe for shipping and handling. At the studio's we accept cash only. The total amount can be prepaid through bank transfer or credit card. Accepted methods of payment are: Visa, Mastercard, Ideal, Mistercash, KBC and regular bank transfer. On all products, supplies and services our terms and conditions apply which can be found on the bottom of this page.